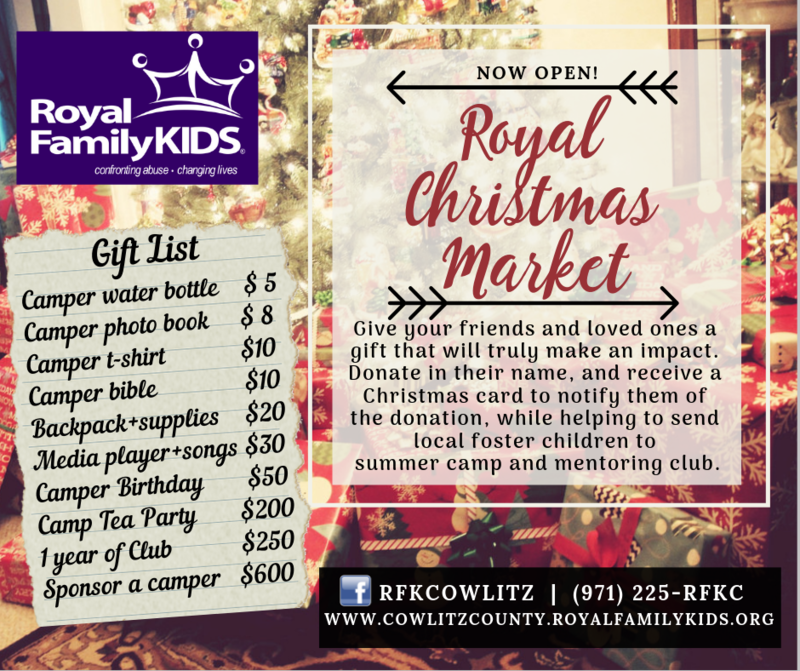 Royal Family KIDS Camp-Cowlitz County is a ministry of Valley Christian Fellowship. Valley Christian Fellowship is a 501(c)3 organization. Would you help us send 24 foster children to camp next summer? You'll be helping us rewrite their stories! Yes! I'd like to make a general donation. Yes, I'd like to make a donation in someone's name. Thank you for choosing to make a lasting impact in a child's life! Please consider making your donation a recurring one, to help us reach even more abused and neglected children in our area. Thank you for making this commitment to impact the lives of the abused and neglected children in our community. When you click “Submit” below, your donation details will be sent to Royal Family KIDS, however, your donation will not be complete until you make payment arrangements. Schedule a one-time or recurring check be sent to us through your own online banking account (most do not charge a fee) or click here to initiate a bank transfer through our online form. A 3% bank processing fee will apply. Click here to initiate a credit card payment. A 3% bank processing fee will apply. Valley Christian Fellowship is a 501(c)3 organization. Make sure “Royal Family KIDS” is noted in the check memo or on the offering envelope. If the name listed on your check does not match the name you provided during this order, please use the “Comments” field below to provide the name under which your donation will be received. Don’t forget to click “Submit” to send your donation details to us! We'd love to hear from you! Please leave us a note if you'd like any additional information or have any questions. Be sure to include your contact information! Yes! I'd like to make a donation in someone's name as my present to them. I live in Longview, WA. I will pick up my card(s). I would like an e-card emailed to me, which I will forward to the gift recipient(s). I do not need a card. You may choose one or more sponsorship amounts or enter a custom amount below. Yes! Please add me to Royal Family KIDS-Cowlitz County's monthly email list. Please indicate which e-card(s) you would like emailed to you. Schedule a check be sent to us through your own online banking account (most do not charge a fee) or initiate a bank transfer by clicking here. A 3% bank processing fee will apply. If you prefer to give online, click here. A 3% bank processing fee will be charged. Drop your donation in the offering at any Valley Christian Fellowship service (separate from your regular tithe). Where would you like to pickup your cards? We will email you to confirm your cards are ready and will be available at the location you specified above. If you are picking up at a worship service, please visit our Royal Christmas Market table after the service. * Provide cash or check when picking up your cards. Schedule a check be sent to us through your own online banking account (most do not charge a fee) or initiate a bank transfer by clicking here. A 3% processing fee will apply. * Drop your donation in the offering at any Valley Christian Fellowship service (separate from your regular tithe). I have read the above information and understand my donation will not be processed until I have made a payment by one of the above-listed methods. I will be sure to list "Royal Family KIDS" in the memo if paying by check, or as the "Special Offering" if paying by credit card. I realize I still need to click "Submit" below to complete my donation, as well. I realize that if an excess or a deficit of donations are received for any specific camp expense and/or there is a deficit of funds or volunteers to launch Club in 2019, RFK Cowlitz leadership reserves the right to redirect funds to cover general camp expenses.